I bought this bundle just over a week ago. I am an extremely overweight female (8 stone plus to lose!). I was initially calorie counting and had lost over a stone but then the weight just wasn't coming off despite being incredibly strict and going to the gym (cardio and heavy weights) 4-5 times per week. Frustrated, I bought this bundle, stopped calorie counting and switched to a clean eating plan. The shake mixes very well. I only tend to have one to two daily but I find it really tasty and easy to drink (although perhaps its a little bit too sweet). I don't have much to say about the multivitamin, does what it says on the tin I guess. I felt the thermopure tablets made the greatest difference. I have so much more energy in the gym and sweat buckets. I feel like I can really do much more than I previously could. It weird I feel really motivated once I take these, it really gives you a great energy boost. If you look at the price of these tablets alone then really the bundle is great value for money. I can't speak for the creatinine as I haven't used it (my husband uses this). Anyway in one week I have lost 8 pounds! I am delighted and it really has given me the boost I need to push ahead with my (rather overwhelming!) weight loss goals. Arguably, a few different factors have probably contributed to this weight loss i.e. change in diet, however I do feel the bundle gave me the extra support I needed to achieve this. Hopefully I will come back in a few months time with some more good news! I'm a 35 year old guy who normally runs rather than any gym weights. I was a bit lost on where to start, but based on the advice of the site bought this bundle. The whey protein in smooth choc tastes fine. It is hardly a drink you would go and buy for the sake of the flavor but that's not the purpose of the drink anyway. I mix it with 200ml of water and that seems to be about the same thickness as a standard bought shake from a supermarket. I add the creatine to the shake to save on making multiple shakes through the day when not on a training day. On a training day I still just have one shake, but I "double up" and have as I leave the gym. I would recommend the pack for a starter like me, but be realistic on the expectations of training. This pack wont by itself create the body you want, but it can be a part in helping you get there. The protein tastes good and I see no problems with the creatine and the daily vitamins, but it would be nice if they remembered the thermopure. 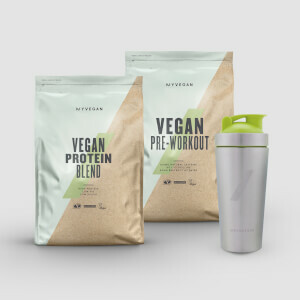 I mean there are only 4 items in this bundle, and they completely forgot the one thing I was most interested in trying. Quick delivery from when i ordered. the shake tastes just like a non protein milkshake, and i have gained positive results from it. 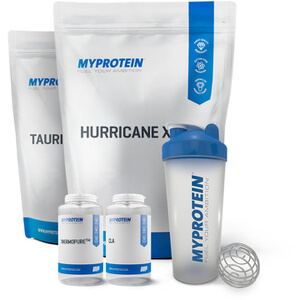 I bought this product about a week ago, I've been having 1 Thermopure in the morning with a multivitamin, 1 scoop of the whey and 2 small scoops of creatine, mixed with about 200ml of water (that's all it needs as I like it quite thick) then same again after I workout whilst eating chicken and rice twice a day. I've been doing this for a week and already noticed some good gains along with great energy in the gym. Highly recommend this product. 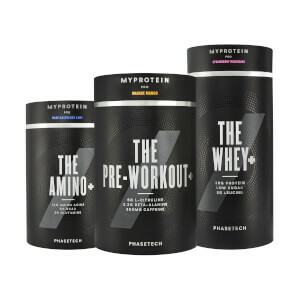 This bundle is great for getting yourself started or back to the gym. I've been using it for over a week now with my training and diet and I've already seen improvement and weight loss. The protein tastes really nice and I'm not a fan of chocolate flavoured drinks. The thermopure, I feel, is good for supressing hunger which helps with the diet. 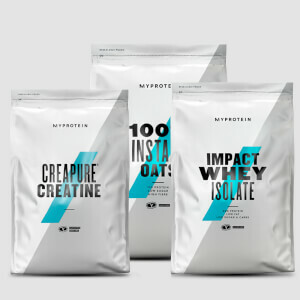 The creatine is easy and quick to drink which is good as they never taste great, and I can push out more in the gym. All good stuff.